"I nipped out for a morning photo session down at Ullswater only to find the lake covered in a thick blanket of mist. Visibility was down to about 20 yards when I arrived, but hoping it would clear I set up the camera and tripod anyway beneath the pier. It was surprsingly quiet and calm as I waited. After half an hour or so, a warm glow spread across the water as the mist started to thin. I was struck by the beauty of the pier's timber structure, partly lit, partly sihouetted as it stretched out onto the lake. " 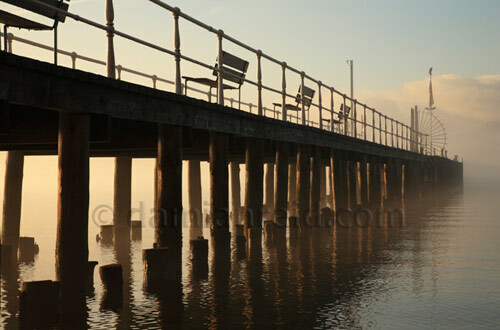 Update: This image is of the old pier. It was replaced with a more modern, larger version in 2010.